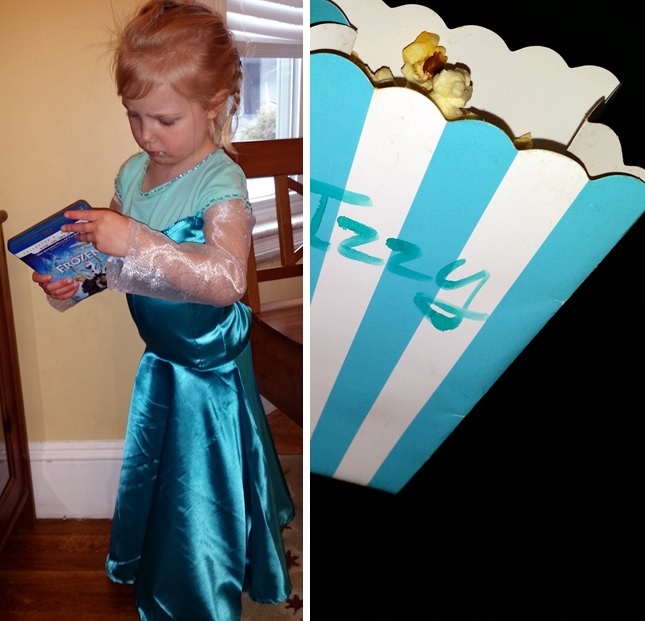 My niece, like most four-year-old girls lately, is deeply obsessed with the film “Frozen”. I know there’s an awful lot of hype surrounding this movie, and most of you feel a little (if not a LOT) fed up with the song “Let it Go”. . . but what four-year-old gets the concept of too-much-media-coverage? Not my niece, that’s for sure. 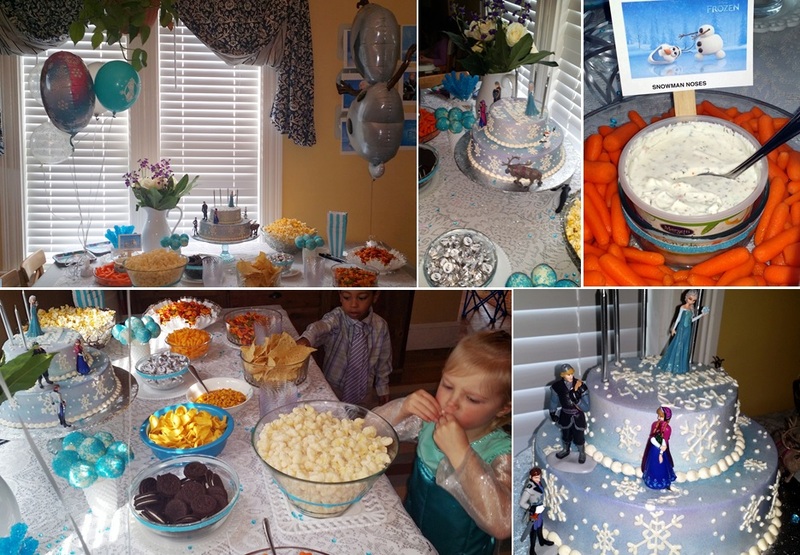 So, when she had her Frozen Birthday Party, it was my job, as a lovingly obsessed aunt, to make sure the details were as wonderful as I could help make them. Question 1: What to Wear? The first question regarding any theme party is one of fashion, am I right? 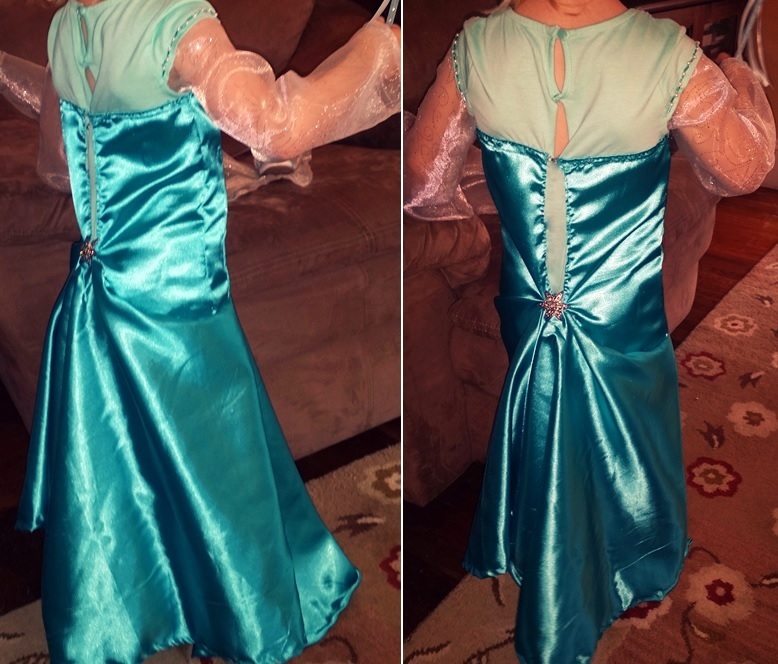 SO, with trepidation and a healthy hatred for mass-produced , overpriced, and poor-quality products, I set about sewing/making a dress fit for a (four-year-old) queen. 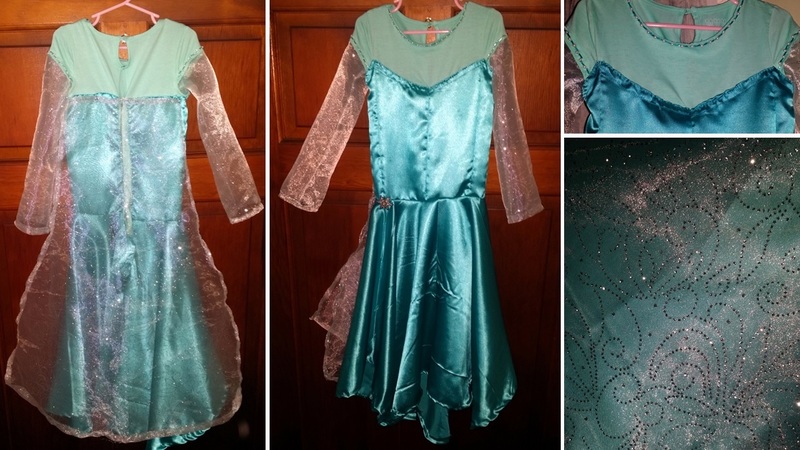 The fabric is all courtesy of Joann Fabrics, and I used a soft t-shirt as the basis for the bodice , so that no itchy seams would bother my sensory-sensitive niece (nothing was sadder than the day she got a beautiful new Cinderella dress and had to take it off because “it hurts real bad”). I made sure the cape was detachable, and (since I was sewing it without my little model present) we used a fancy snowflake pin (thrift store find!) to bustle up the back. 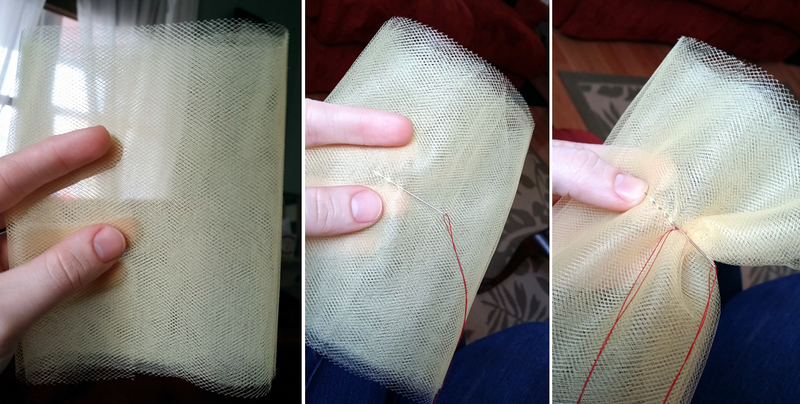 It was by no means a work of art in couture, but it did the trick. Izzy was delighted. 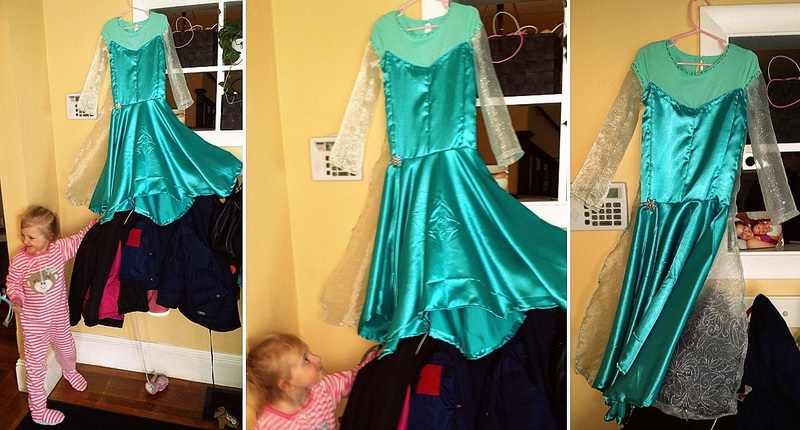 When I walked in and hung it in the front hall, she saw it and immediately exclaimed “MY DRESS!! !” with such joy, that it was worth any&all work involved. 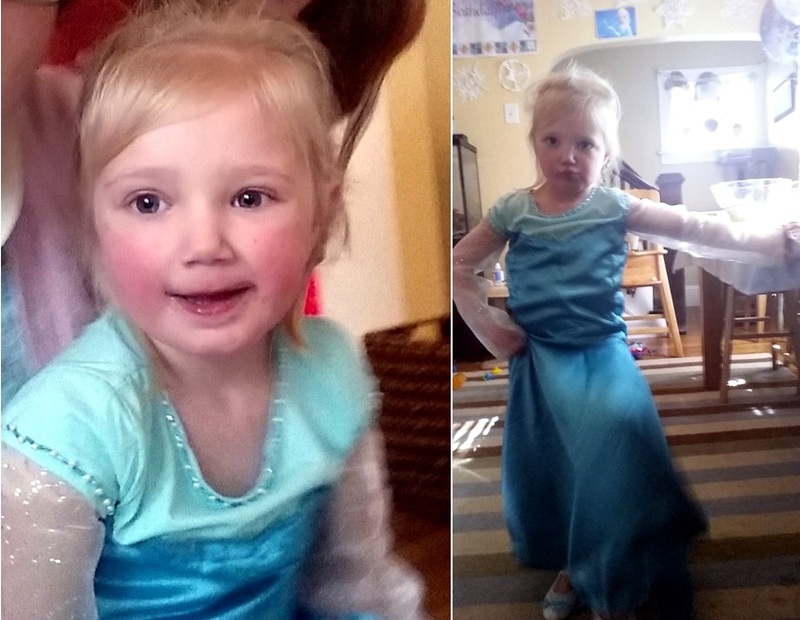 With a little assistance from her Mommy, her hair was tucked into an Elsa-appropriate braid, and the party could start, since the most beautiful princess of all time felt prepped and ready! Seriously, though? 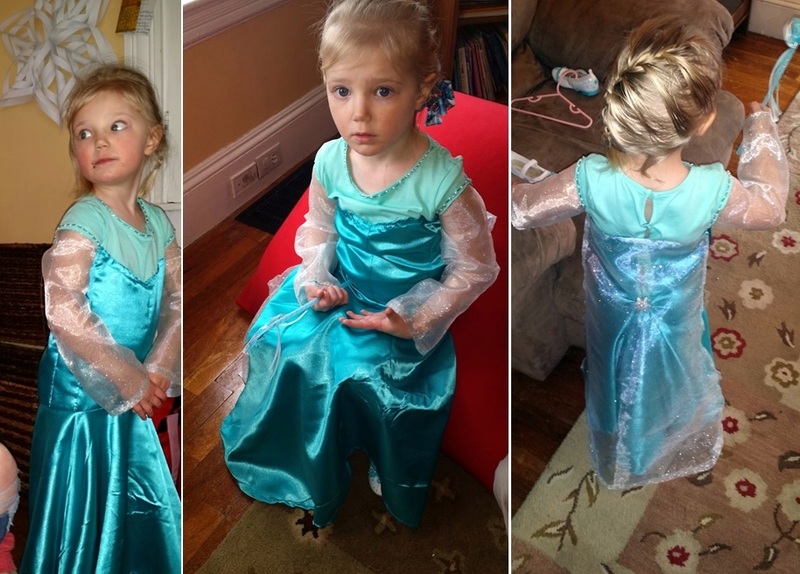 One more picture, because never has there been a mini-Elsa this adorable. Question 2: What to Eat? A birthday is not a birthday without a cake. And D’Amici’s bakery knows how to make a phenomenal cake! 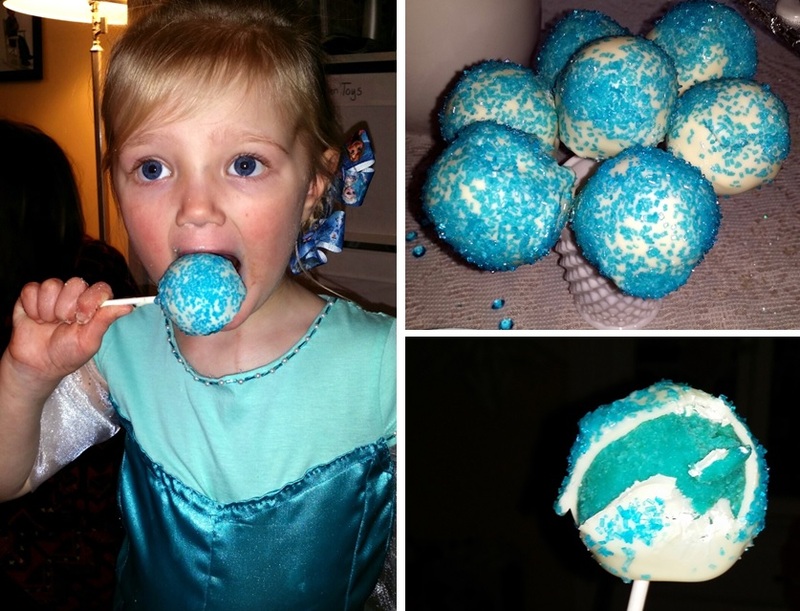 With the cake as a central element, I whipped up some colorfully-appropriate cake pops for those children who prefer all of their food on a stick (ahem: my nephew being one of them!). It was also deemed important to include some more-substantial/less-sweet snacks to balance out all that sugar. Question 3: What to do? 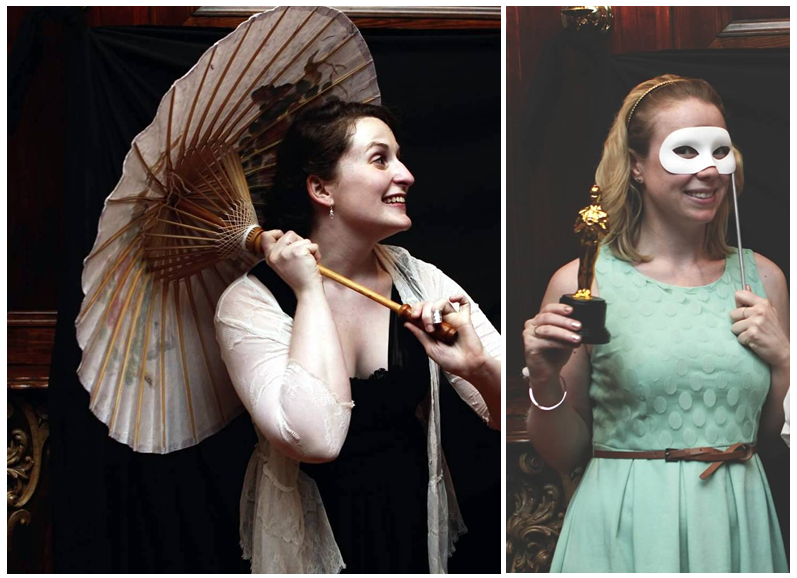 Having a movie-themed party kind of sets the mood for entertainment during the party right? I mean, it’s a given that you will watch the movie at some point. SO, what better idea than to provide cutely-themed popcorn? After movie-watching either ends or loses it’s luster with 3-5 yr. old attention spans, its also nice to have some other potential entertainments. 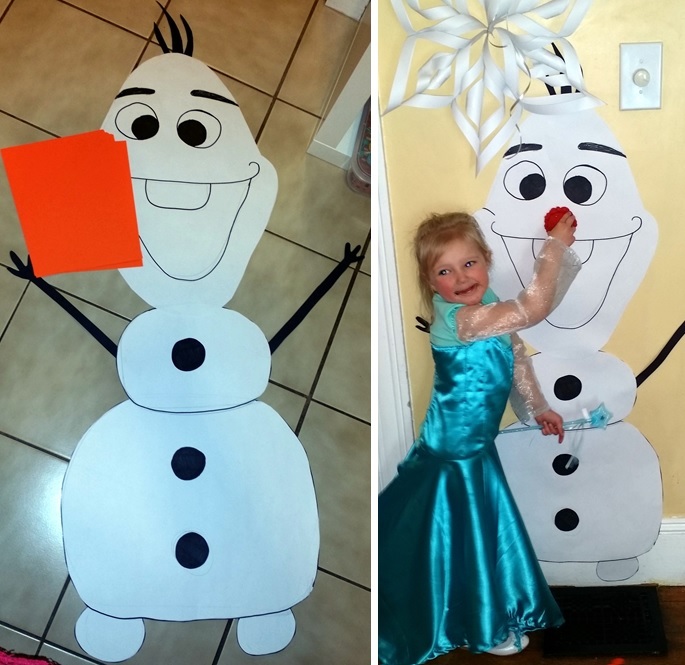 I drew/cut out a large Olaf-shaped snowman for a game of Pin-the-Nose-on-the-Snowman. Olaf also made for a nice decorative touch, chilling on the wall (yes, pun intended). It also turns out that my adorable niece loved the decor far more than the game, because she took one look at the wall, gasped, turned to me, and asked very seriously: “I . . . I marry him?” While she is a bit young to get married, in my humble opinion, Olaf definitely fulfilled his quota on “warm hugs” for the day. One other small activity we chose to include was a mini salon (staffed by yours truly) where all of my frozen-colored nail-polish could be displayed for the kiddos selection and subsequent nail-painting. This was fun, and the many small individuals in attendance loved it! Question #4: What little treats will enhance the day? Well, there are certainly many of these ideas floating around to choose from. 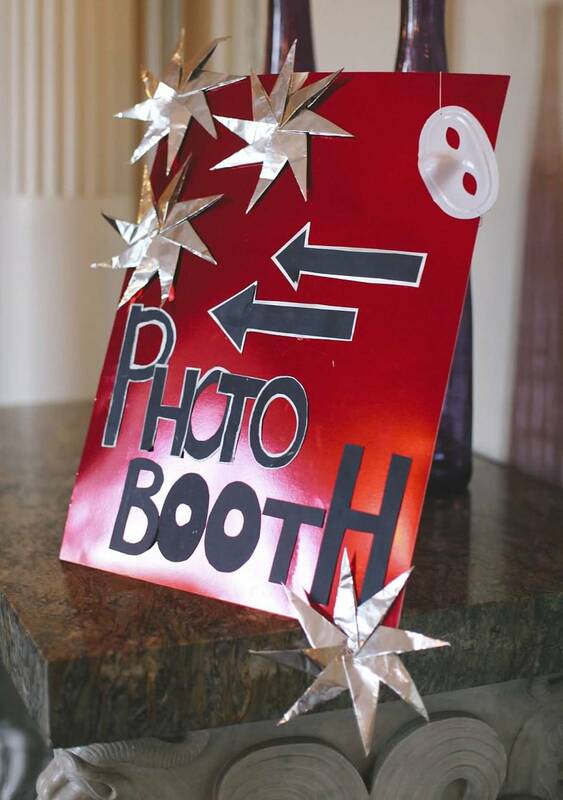 It’s a great chance to check out printables available online (many for free!) that can add to the cute-factor. The Melted Snowman labels for water bottles was a nice touch, and as you can see, there are small olaf-stickers on the chocolate kisses! 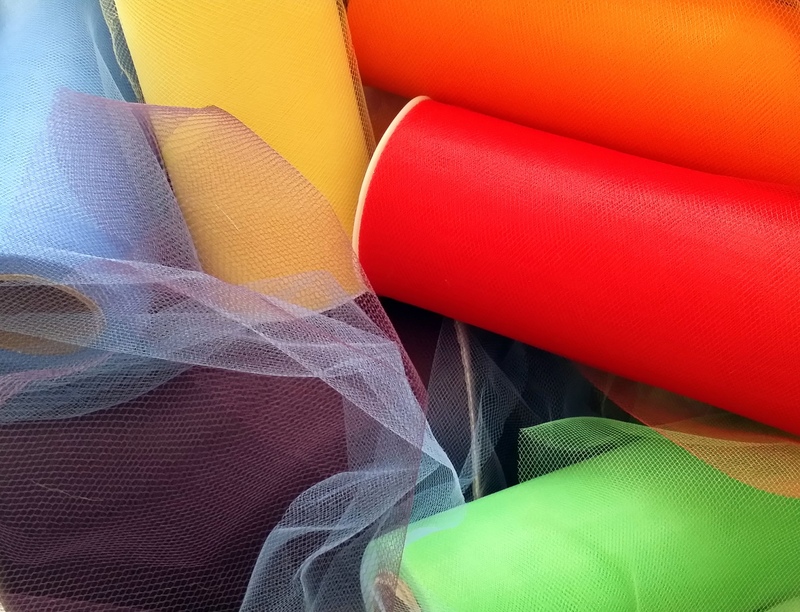 It’s also a great chance to tap into any stores of crystal or milk glass flatware and princess-costumery you have lying around. 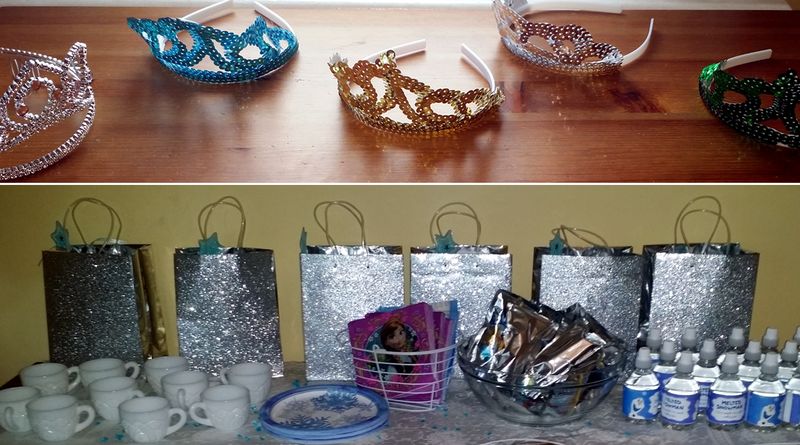 Another fun detail that my sister pulled off beautifully was the sparkly gift-bags for kiddos who attended the party. 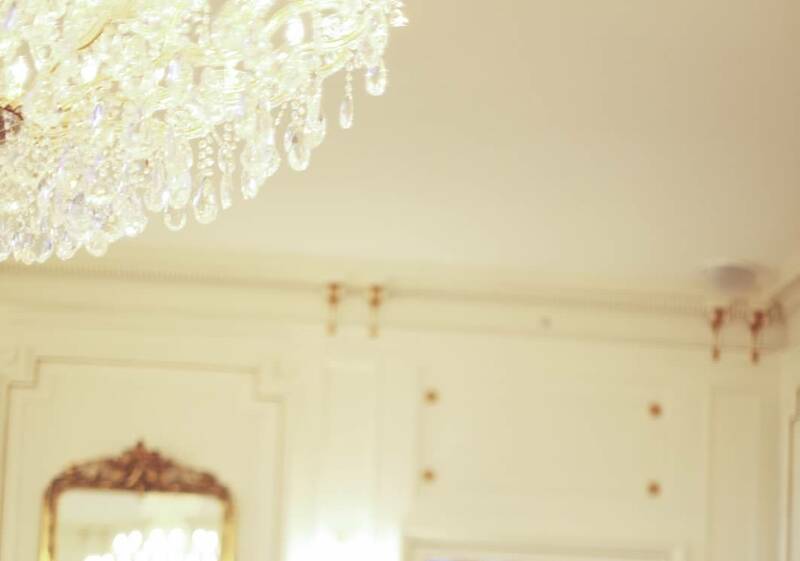 These were full of everything from sweet treats to coloring books to tiaras to the little blue wands that you can see peeking out from the tops of the perfectly-chosen glittery gift bags! And that, friends, is all-questions-answered how we celebrated my niece’s 4th birthday . . .
Every year, as part of the annual school dance preparations, we include the making of Mad-libs. 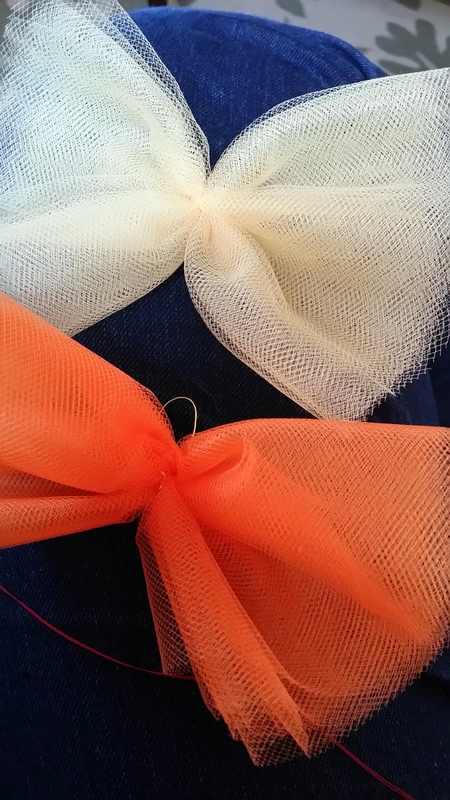 . . after including these as part of the table decor a few years ago, they were met with such positive feedback that we’ve included them ever since! Functioning as a fun ice-breaker and a laughter-filled prelude to dancing, were can you go wrong? (Well, I mean, they are mad libs . . . they tend to go gloriously wrong.) Finding theme-specific mad libs, however, can be something of a challenge. Thus, I have undertaken the writing of original mad libs from time to time, and our recent Candyland Prom was no exception. 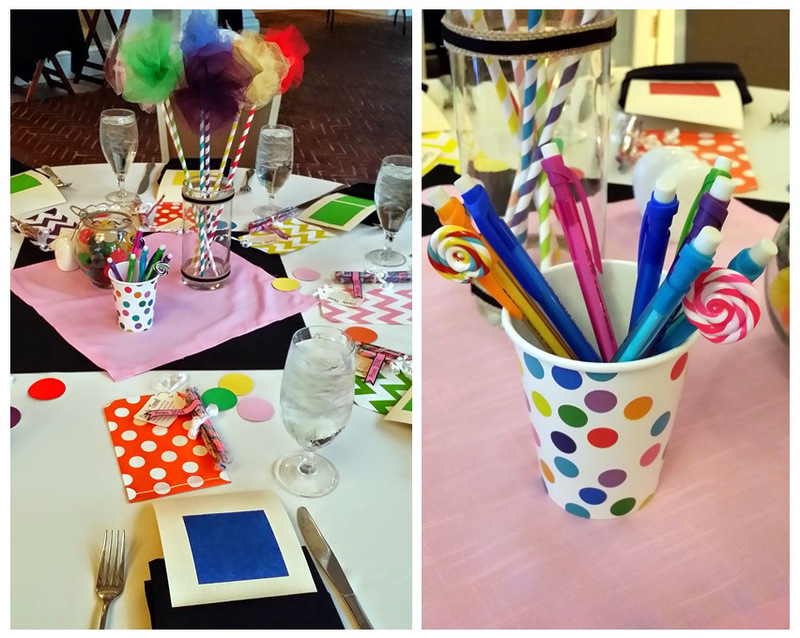 If you would like to download and use a PDF of my two Candy Land Themed Mad-Libs for use at your own sweet event, feel free to click the pink link and do so with my blessing! Also, if you want to make changes to anything or use the candy-stripe font I used on anything else (for uniformity’s sake), you can find the font available as a free download here. 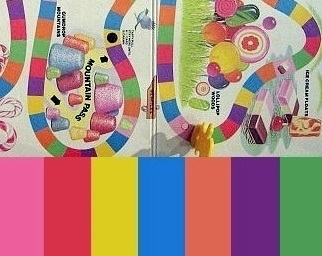 If you would like to follow our example and transform these mad-libs into part of your decor by making them look like large-scale Candyland game-cards, check out the picture and explanation below for some inspiration! We printed the mad-libs on cream-colored stock paper (they are formatted tw0-to-a-page) and then used a paper cutter to make uniform 3.5-inch squares of tissue paper in the requisite colors to adhere to the backs of the mad-libs (using either double-sided tape or glue sticks, depending on availability!). To keep with the colorful theme, I bought the brightest mechanical pencils I could find at Target (which, incidentally, is also where I purchased the polka-dotted paper cups to hold the pencils). 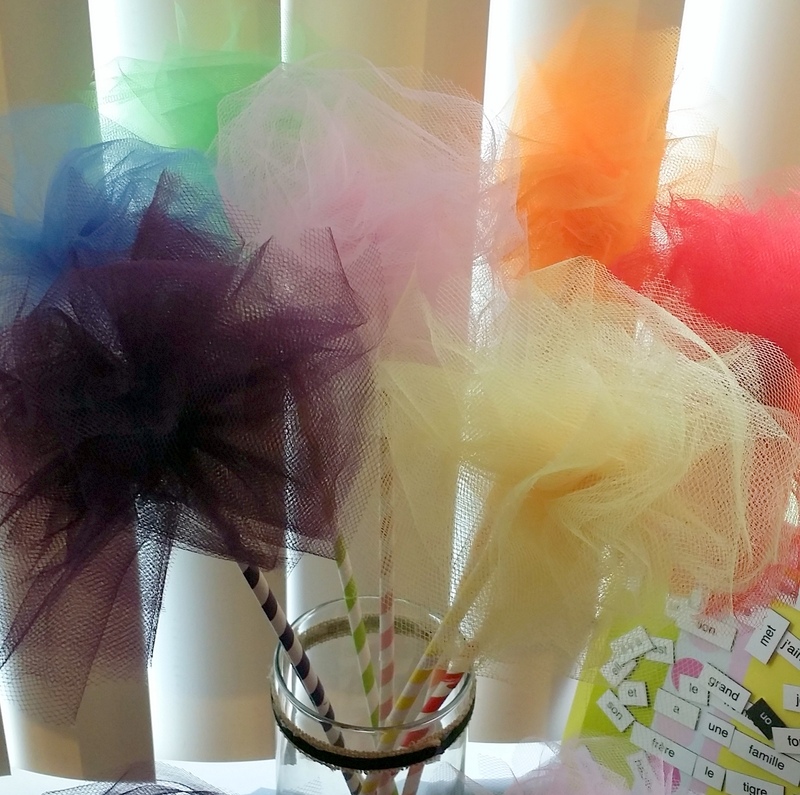 I also bought small fake lollipops from Etsy vendor Twisted Lolly Boutique and hot-glued them to some of the pencils for an added candyland-accent! 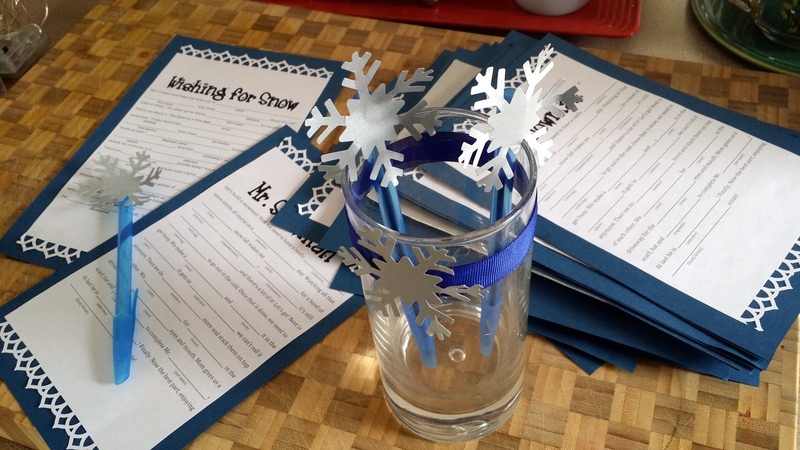 One Winter’s Night: DIY Dinner Dance Decor! 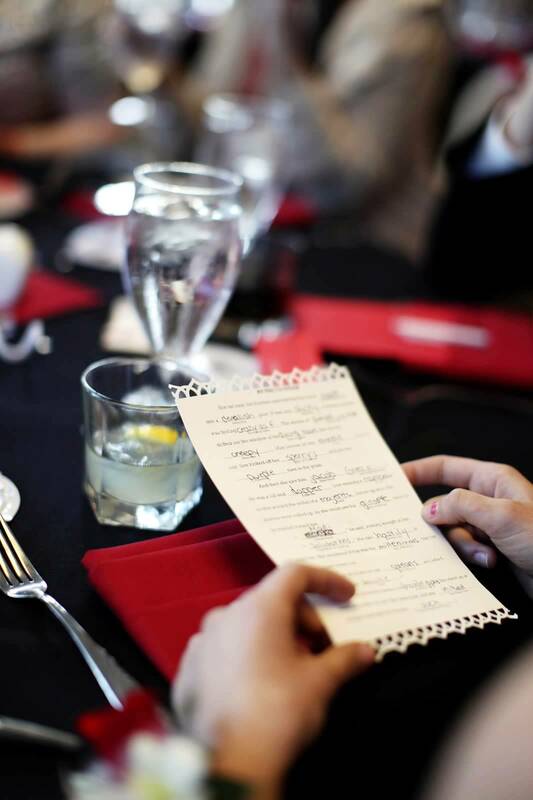 Keeping our plans simple and elegant, we set out to provide thoughtful details that might enhance students’ experiences of the evening in question. Some of the things that we organized as part of this year’s festivities included . 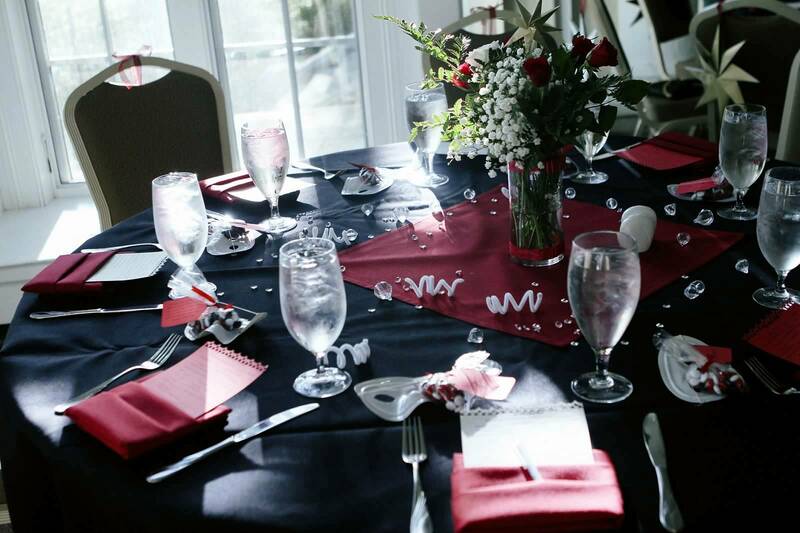 . .
We have the delightful opportunity of enjoying the delicious menu of italian cuisine provided by our venue of quality! The spread was delicious and everyone ranted about the chicken parm in particular. 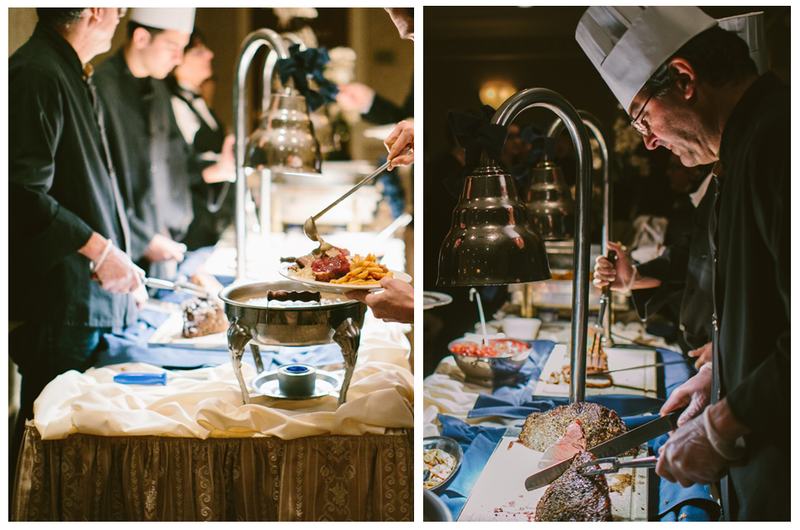 The food, however, was just a small organizational detail of the rest of the planning, which was far more hands-on! What better to give as a favor for a Winter Ball than Hot Cocoa? Inspired by some adorable winter wedding favors on pinterest, we decided that it would be a fun direction to go, and we were not mistaken. We designed our own label, used some of the same cardstock we used for the leaf-creation, and put them together one chilly Wednesday afternoon. They turned out adorable! 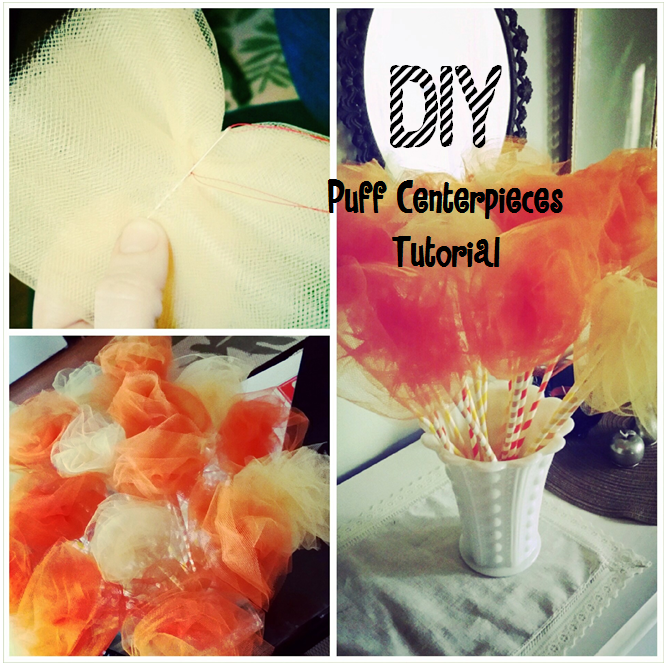 For several weeks before the dance, we brainstormed ideas for the centerpieces. 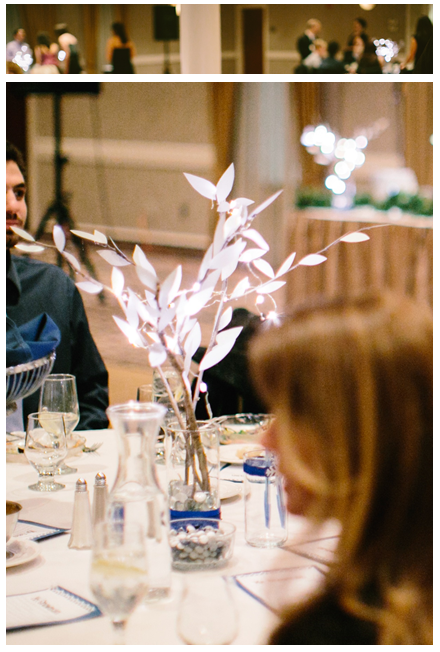 In years past we’ve done everything from live fish to traditional floral arrangements to elaborate candy jars, and we’ve come to the conclusion that non-living centerpieces can render the set-up far less stressful! After doing some scouting and brainstorming, one of my students remembered that I had made some paper-leaf branches at one point. 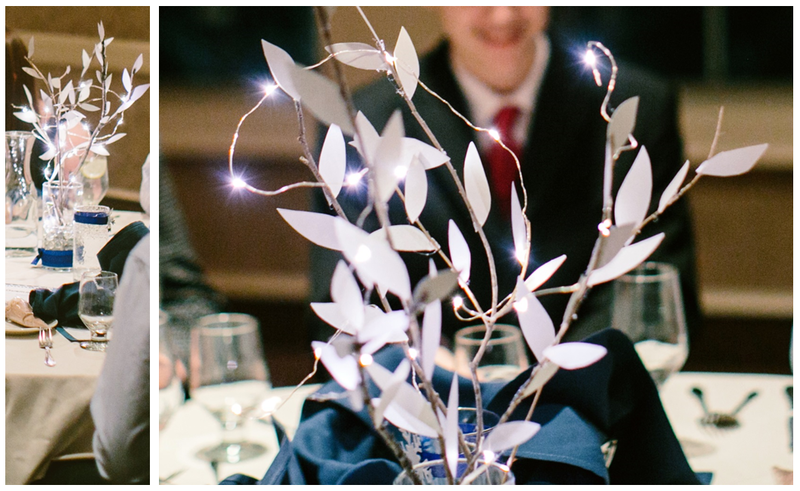 We looked at the paperstock available online, and decided to make our own silvery foliage, just for the occasion. Making these branches was a cinch, actually. First, we gathered up some sticks from the trail around the school. Then we made two different sizes for leaves and cut them all out by hand before attaching them with hot glue to the branches we had collected. 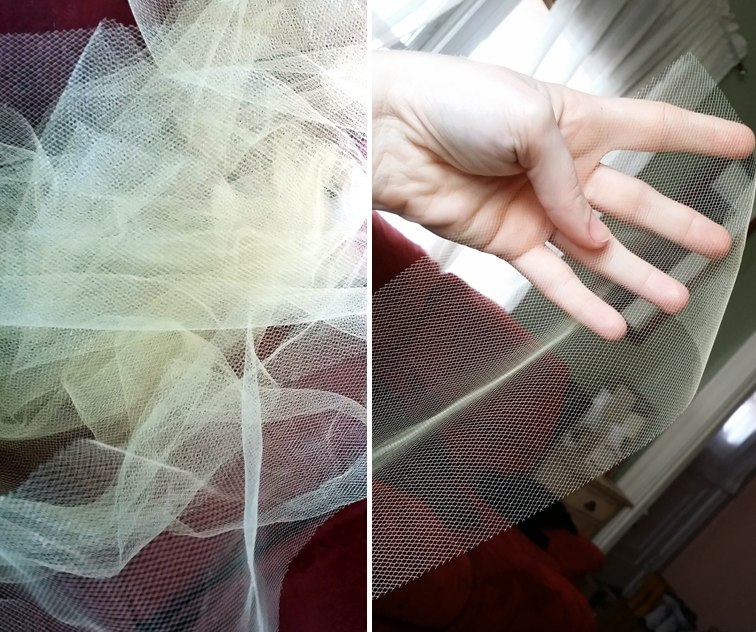 The result looked quite lovely! 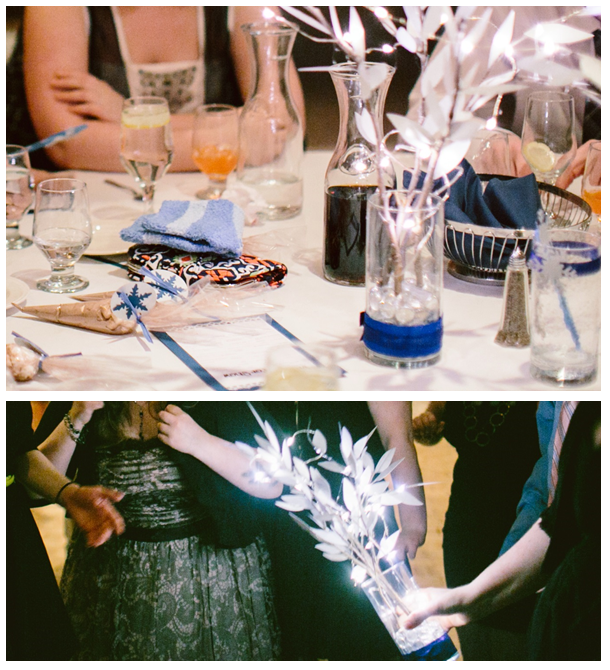 After making the branches, we purchased some beautiful twinkly lights (via Amazon.com) to twine through them and the result was like something out of a fairy-tale! 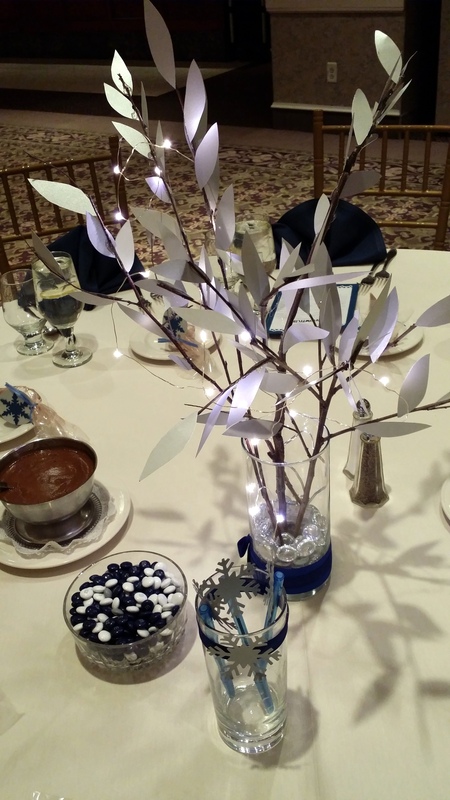 To these leafy, twinkly, not-quite-floral arrangements, we added a cut-crystal dish of navy-blue, white, and silver m&ms as well as a small glass to hold those lovely, snow-flakey pens pictured above. What might theeeeey be for, you ask? Well, I’m so glad you brought it up, because that brings us to our next element of themed fun . 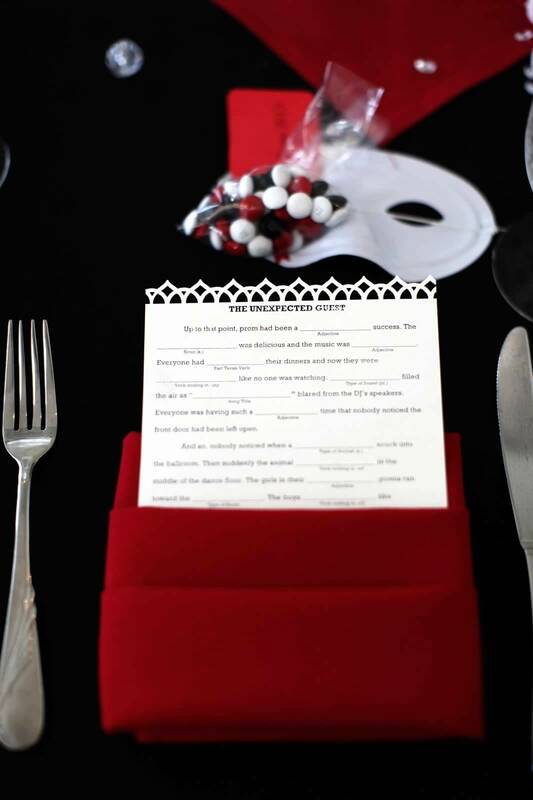 . .
Mad libs are something that we make a point to include every year, at every dance. For one thing, they help break the ice and fill those occasionally stilted social moments before dinner or dancing commence. But, for another thing, who doesn’t like mad-libs? 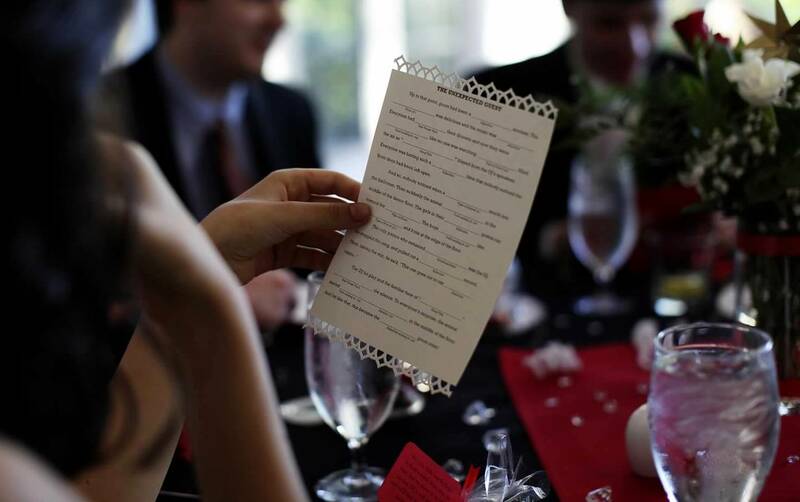 We used a paper punch to make this batch particularly dainty and then placed them at each place setting on the big night. There is no better atmosphere than laughter. 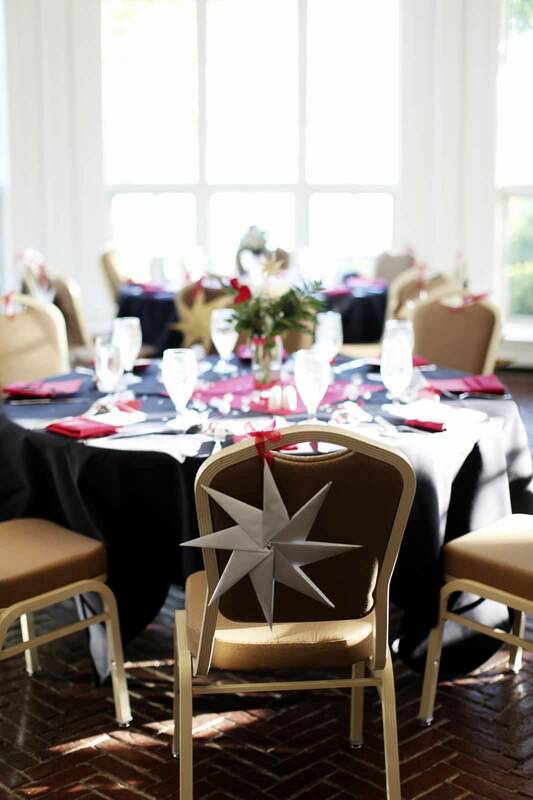 All photo credit goes to our awesome photographers, Danny and Brandi Ebersole!